A few months after the first official release of my free hydroponic nutrient calculator it seems that many people are using it to imitate commercial hydroponic fertilizer formulations. Although the calculator had the capacity to do this from the time when the "salts to formulations" feature was implemented many users apparently did not know how to use this very well and the process seemed to be more extensive than what would be ideally necessary to get the end ppm concentration values of some commercial fertilizer formulations. 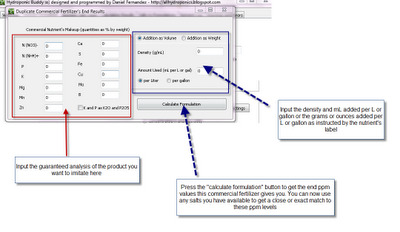 In order to make the process far easier I decided to implement a new feature within the calculator that allows anyone to easily input the guaranteed analysis of any commercial fertilizer, the density, the amount of mL or grams added per Liter or gallon and get the end ppm values which can now be used as a recipe in order to come up with a personal formulation that exactly mimics this end result. This new feature - as shown above- is accessible through a button in the "Desired Formulation" tab. This button is located between the water quality and instrument precision buttons, just below the "preparation type" dialogue box. When this button is clicked a new window pops up in which the user can input the percentage composition of the commercial fertilizer he/she wishes to imitate as well as the manner in which this commercial fertilizer is supposed to be added in order to arrive at the final concentrations intended by the manufacturer. For liquid fertilizers the maker usually gives you a volume measure to add per gallon or liter which should be expressed as mL per gallon or liter (you can choose if you want to specify the quantity added per gallon or liter using the radio buttons for this purpose). In the case of solid fertilizers the label usually tells you to add a given number of grams or ounces per liter or gallon. You can choose between specifying a given volume and density or a given weight by using the "Addition as weight" or "Addition as volume" radio buttons located at the top right of the new window. 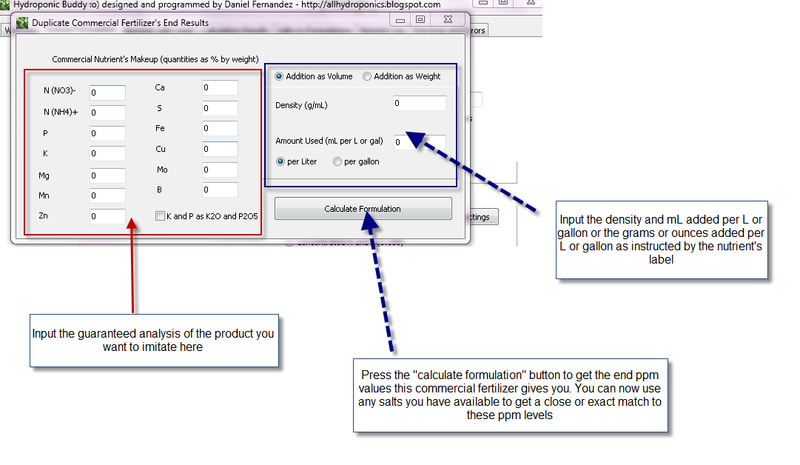 Once you input these parameters you are now ready to get the intended end result for this commercial fertilizer by using the "Calculate Formulation" button. 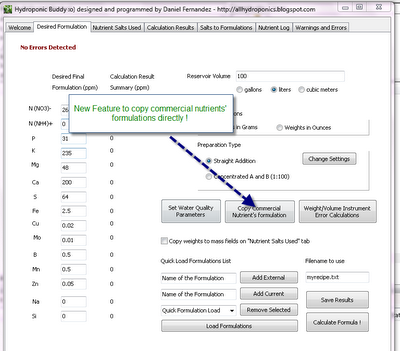 When you click this button the program will automatically calculate the end concentrations which result from adding the amount of the commercial nutrients you specified with the composition you also specified. 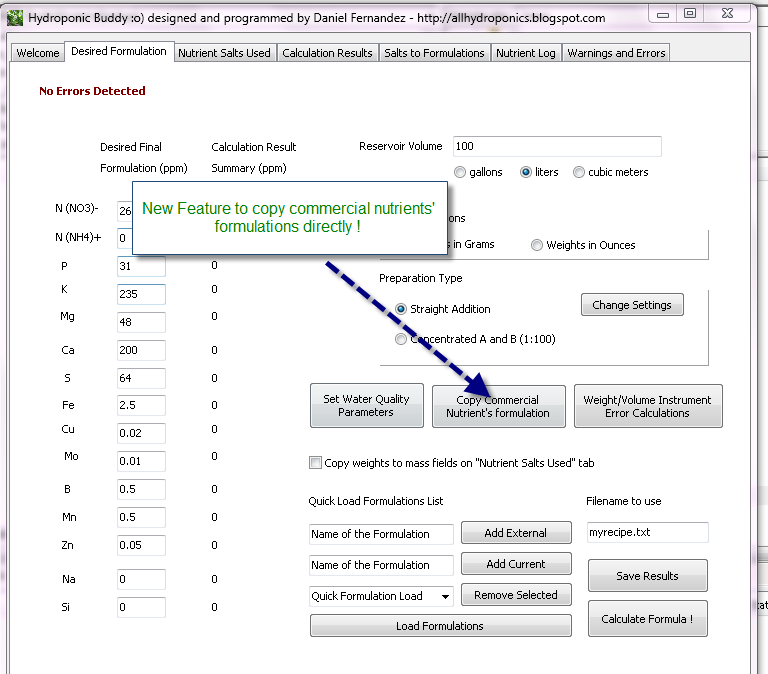 These values are automatically copied to the "Desired Final Formulation" column and they can now be used to imitate the commercial formulation. You can now select a given number of salts you have available and use the regular preparation types in order to come up with a direct addition or 1:100 concentrated solution which will match up the end concentration results achieved with the commercial fertilizer you input. Of course, this will NOT guarantee a perfect copy of the commercial fertilizer since many of the ingredients a commercial fertilizer may contain may not be listed or they can be listed but their actual concentration levels may not be specified. For example you will find that many commercial nutrients contain Boron but their guaranteed analysis does not show it. This is mainly because the law does not require them to include boron in their analysis and therefore they will add it but they will not disclose its actual concentration or sometimes even its presence. Several other additives or nutrients may receive similar treatment so for this reason it is always good to make up A and B concentrated solutions or direct additions which include ALL elements necessary for plant growth. I am making my first batch of hydroponic fertilizer. I have a two part formula and I am finished with the A part. I am now attempting to dissolve some monopotassium phosphate in some distilled water, but it is just sitting on the bottom of the bucket Im mixing it in. It isnt dissolving. Everything I read about this stuff says it is highly soluble. Do I need to use boiling water? Thanks for helping me Daniel. I bought it from Cropking, it is definately the right kind. I am attempting to dissolve 100 oz in 2.5 gallons of water. Am I using too little water?<br /><br />Thanks! Hi,<br /><br />I think I may have solved my own dilemma. I found a web page about the solubility of various fertilizer salts. <br /><br />http://www.smart-fertilizer.com/articles/fertilizer-solubility<br /><br />The MPK that I am attempting to dissolve is soluble at a rate of 180 grams per liter at 10 degrees C. At 20 degrees C it is soluble at 230 grams per liter. I can either warm my solution or use more distilled water. <br /><br />Instead of making 5 gallon batch I will make an 8 gallon batch (4 gallons A + 4 gallons B), which should solve my problem. Hello Raurs, I am having the same problem...Did you figure out what was going on? Hi, Support free source software and info so I did ?. I'm making a grow a and b for my indoor garden but I'm having some confusion over the type of iron I need, I know it's water soluble (no brained) but am I after x% chelated iron or more of an iron sulphate? I'm guessing that I just enter what I have and your brain child does the rest? Anyway thanks again. Hi Daniel thank you so much!!! I'm new to mixing stock solutions. I have a commercial brand I like as they have a vegetative solution, bloom , and a micro used in conjunction, but in varying volumes depending on the where the plant is in the season. They list ingredients and only guaranteed analysis of what is required by law. For ease of use I'd like to copy their solution, but I don't know that there is enough info to replicate it. So is there any advice on how I can achieve the proper ppm of the same elements in an A B solution and vary them depending on the plants development? Dear Daniel, Great job with calculator. I have recently entered the arena of hydroponics and have built a system similar to art garden (you tube). I am presently running just one barrel and should be running a 20 barrel system (800 grow sited) in two months (WIP). I want get into commercial hydroponic farming, that is the goal. Anyways I need your help in imitating a 3 part commercial nutrient. My queries are as below: 1. For imitating a 3 part fertilizer do I need to calculate values for each part individually or there is some smarter way to do it or cant be done 2. I have confusion with volume of addition field because the maker gives different values for same as it depends on the plant stage. So which value to use? 3. One part of commercial nutrient uses three sources of Potassium (Potassium Carbonate,Potassium Phosphate, and Potassium Sulfate). I have added same in substance selection but during calculation Potassium Carbonate and Potassium Sulfate is ignored by calculator. Is there any way all three can be used for calculation. Also I am not sure in what proportion the calculator will consider it. 4. For sulfur in the final result I am getting gross error as -79.3%. What could be the reason. List of substances used FYR---> Magnesium Carbonate Magnesium Sulfate (Heptahydrate) Phosphoric Acid (30%) Potassium Carbonate Potassium Dibasic Phosphate Potassium Monobasic Phosphate Potassium Sulfate I am very new at this so if I am doing something stupid let me know. Hi Tushar, Thanks for writing. In general I only answer questions specific to the blog post within the comments section. If you are interested in having questions about your particular problems answered please book an hour of consultation time here (http://scienceinhydroponics.com/book-now) or contact me directly using the contact page to arrange for a time and payment (http://scienceinhydroponics.com/contacts). Thanks again for writing, Best regards, Dr. Daniel Fernandez Ph.D.